ZipTip: DISTANCE CONTROL / TOUCH: Short Putts are Tough to Sink! Lord knows putts in the three- to six-foot range are tough! Why in the world is that? Part of the explanation is often psychological, but if you know some special technique, the psychology becomes much less a factor. The long and short of short putting is: the hole is TOO BIG, the eyes see TOO MUCH, and the length of the putt is TOO SHORT! Putting acumen declines precipitously with distance -- we all know that. But did you also know that the most DRASTIC decline in our ability to putt comes between three and six feet? At three feet, we usually make at least 9 out of 10 of the putts (90%). But back up a mere three more feet and almost all golfers are reduced to 50% at best. That's FORTY percent decline in three measley feet! And that's pro and amateur alike. What is it about this range? Well, your eyes, and your neck. Your Eyes -- the Peek. The hole as target is visible in our periphery as we stand at address gazing in the direction of the ball. Peripheral vision angles off to the side of our straight-ahead look about 70 degrees or so. You can detect motion all the way out to 90 degrees, but recognizing forms and paying attention to them while gazing straight only begins around 70 degrees. As you bend the head at address, the eyes are around four feet above the ground, looking straight down. The periphery, then, takes in about six to eight feet to our sides, and that includes the hole as a dark oval shape. Many pros say the "presence" of the hole in the periphery combines with your eagerness or anxiety and causes you during the stroke to turn your eyes too quickly to the hole. This is an engrained pattern of eye usage. And many believe that "the stroke follows the eyes." Well, that's partly right, and partly wrong. If the eye movement really goes to the hole, then you should make the putt even when you peek early. So there must be more to it than just looking early. I believe there are three problems with looking early. First, perhaps you DON'T really look at the hole when you peek. If you pay close attention, I bet you'll find that, yes, you move your head or your eyes toward the hole, but not exactly AT and TO the hole. This is partly because the most natural, engrained head movement (targetward) is chin-inward toward the shoulder, not a level swivel. This carries the gaze INSIDE the hole. People who have this eye-usage pattern miss to the inside a lot. Second, another way this happen is for the eyes to shift targetward even if the head is still (or mostly so). If the eyes were shifting to a wasp zooming at your face, you would have NO problem looking AT the bug. Your brain handles that very well. But when you turn to look at a stationary object or location (like the hole) presenting no threat the tendency is to be casual and just get the hole somewhere in your field of view. If you "see" the hole, what's the problem? The problem is the stroke does not "follow" the eyes to whatever is in the field of vision; it follows the point of focal attention. Just getting the hole into view doesn't give you a focused point, so the stroke wanders. People who use the eyes this way get it close but still miss too many, either short, left, or right. Third, changing visual attention disrupts the mapping and stroke execution. In order to make a good, straight stroke, you need to watch where you hit the ball. By that, I mean look at the ball the WHOLE TIME the putterhead is coming into impact. More precisely, you should look with a fixed, straight gaze at a dimple on the back of the ball you plan to hit squarely. This sort of use of the eye is necessary to prevent striking the ball off to the side of this point, thereby missing the putt. But it's more than that, too. When the head moves or when the gaze shifts away from this looking at the back dimple, the brain automatically gets ready for the next thing, whatever that might be. Consequently, the brain thinks all the work you did to aim, and target, and think about the stroke is no longer needed. The battle plan, in so many words, gets shredded -- at precisely the wrong time -- just before impact! Your Neck -- a Good Turn. One of the main targeting cues comes from the direction and extent of the neck's turn as we look from the ball to the hole. Done properly, this turn carries the gaze along a straight line on the ground from the ball to the target, tracing the start line faithfully. But the important information is not in watching the turf; it comes from the ANGLE of turn and its PACE. The longer the putt, the greater the neck turn's angle, and the better the information for the stroke. Paradoxically, putts in the range of three to six feet are TOO SHORT! The neck doesn't get turned enough to establish a solid fix on the stroke's direction. The stroke in plane mimics the neck turn in plane. Imagine looking down at the ball, and you dominant eye connected to the ball by a thin glass rod. A good head turn carries that ball straight along the ground into the hole. The direction of focal gaze has to go right into the hole as the neck turns, and a turn that merely brings the hole into view is not good enough. Past about six feet, the hole is not vividly present in our peripheral attention, AND the length of the putt improves our neck-turn input. The Size of the Hole -- TOO BIG! From within six feet, our targeting is negatively affected by the apparent size of the hole. At six feet, with the eyes about four feet off the ground, the hole "appears" a certain width. This apparent "angular width" widens as you get closer to the hole, and shrinks as you pull farther back from the hole. On a six-foot putt, the eyes are about seven feet from the hole, and at the distance the hole "looks" about 3 degrees wide. What the heck does that mean to you? The ball below you at address, four feet away, looks about 2 degrees wide. So is your thumb at arm's length. Hold your thumb out and it covers the ball. Turn to a hole six feet away and it also almost covers the hole. While this seems like a reasonably "small" target, the truth is it is not. Normal visual acuity (20/20) can see two spots as separate at 20 feet even if they are less than 1/8th inch apart. This is seeing a target with an "angular width" 100 times smaller than the hole at six feet. For a "target" 4.25 inches wide, the eyes have to choose what specifically to look at or else they wander about. A blade of grass 1/8th inch wide on the back lip of the cup is a target that appears about 1/10th of a degree wide. In other words, a hole at six feet presents a visual mob of targets, and you need to choose just one, or else you vision wanders. First, use the eyes the way a dart-throwing champion does. When you locate the bullseye of whatever you are looking at, your head and eyes are still as you fix the target in space. When you look at the ball, look at it this way. When you look at the hole, look at it this way. If you are not focusing in on a precise target in space, you will pay a price in the execution of the stroke. Second, use a regular head turn to the hole that carries a steady gaze in a straight line along the ground. When the only thing moving is your neck, and not your head, body, or eyes, your neck feeds the location of the hole and the plane of the putt to your brain and makes the stroke much better in terms of direction. Third, when you look AT the hole, stay there a bit. Count to four while making sure your attention and eyes are remaining fixed. This gives you a big enough "dose" of where the hole is so that it reduces your compulsion to peek, and it also aids in planning the stroke. It doesn't hurt to imagine throwing a visual "dart" right into the center of the hole, or perhaps tossing a penny into the cup. This sharpens your localization of the hole as one definite place in space in a fixed relationship to your body at address. Fourth, when you look back from the hole to the ball, become familiar with the blades of grass the ball MUST roll over to go in the hole. You cannot miss these blades of grass by much and still hope to get the ball in the hole. You might want to "perforate" the path with your laser-like vision, spotting anchor-points on the line every foot or so as your head turns your gaze back to the ball. Finally, when you get back to the ball, these targeting routines have given you an unshakable confidence in the starting line of the putt. So connect the start line up to the ball by seeing the same line extend back through the ball, highlighting one single dimple on the front equator and one single dimple on the back equator. That is the line through the ball that the square putter face must traverse, and not just the putterface in general, but the sweetspot itself must be moved through the ball on this line. Once you see this about the ball, look AT the ball during the stroke to make sure you do what you want to do during impact. Paying this sort of visual attention to the task, and knowing why, makes it much less likely you will peek before impact. 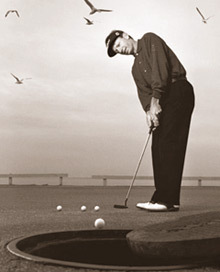 Short putts are deceptive because the hole is TOO BIG visually, the hole is TOO NEAR in the field of view promoting peeking, and the neck turn is TOO SHORT for good aiming of the stroke. Give short putts the full-dress targeting treatment. Stopping the eyes from wandering by focusing tightly on your visual objects of interest helps overcome these problems. In general, never underestimate a short putt...long putts are a lot easier!